It’s easy to say “Do the work in a way that allows the team to build itself,” but is it easy to do? It is. These questions precede every ice-breaker I’ve ever been a part of. Three minutes later, everyone in the place is engaged, smiling, talking, and doing. After twenty minutes, just try and stop them! It’s like throwing yourself in front of a fast-moving train. What makes icebreakers so irresistible? ACTION. You get just enough information to get moving. ENGAGEMENT. The goal is clear. The task is interesting. Or confusing. Or frustrating. It doesn’t matter which. Even as you react you’re getting pulled in. INTERACTION. Everyone has something to do, and you need each other to accomplish the task. You have to talk to each other. STRUCTURE. There are steps, clearly outlined. There are roles, clearly spelled out. You can see the progress you’re making. If you follow instructions, you’ll succeed. So you do. It’s no accident that icebreakers are more energizing than the rest of the meeting. They’re designed to be. Let’s change that. Let’s make every part of your meeting drive to action,with interaction and engagement for all. Let’s structure it that way. I know it seems backwards that structure leads to fluidity. I know you want to say that open discussion is the only truly democratic process, that too much structure shuts people down, that we’re all adults and we know how to behave. But that’s not my experience. Structure precedes performance. Just ask the musician who practices scales every day, or the dancer who takes class, or the athlete who works out. The structure you ingrain frees you to express and and create. Meetings aren’t democratic. Just ask the CEO or your boss. There are guidelines, guardrails and hard choices to be made. You won’t all be delighted. That’s just the way of it. Adults act according to what they believe to be true. If those beliefs are correct and held by all, woo-who! If not, we’ve got trouble. And we don’t want trouble. We want the way teams do their work to build the team. Structure is what makes this work, just like structure and planning make icebreakers work. 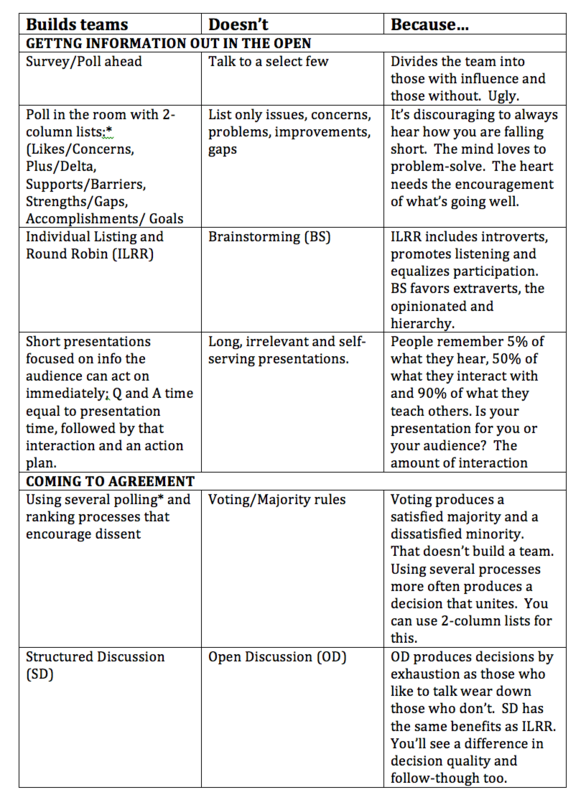 The table below compares the structured approach (“Builds Teams” )to common meeting tasks with the unstructured approach (“Doesn’t”). The third column (“Because”) is why the unstructured approach gets in the way of building the team. Continuing to use an approach that tears down the team undoes all the progress you made with the icebreaker. Subscribers to my Collaboration Genius newsletter, get the details for all these methods and a few others as well. Isn’t it time you subscribed? I’m low maintenance, funny, and the information is useful. The sign-up box is in the upper right-hand corner of the page.